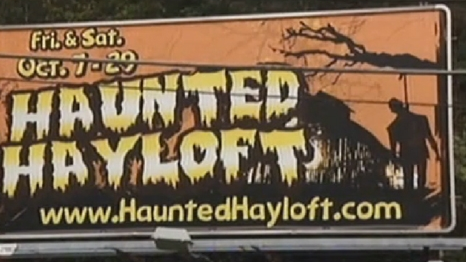 When Pittsburgh area Halloween Attraction “Haunted Hayloft” posted 70+ billboards in the city. No one took into account the reaction that they’d get from neighboring families. As you can see from the image; the drawing includes a silhouette of a man hung by a rope from a tree. Locals state the billboard located on Perrysville Avenue (an area that is 99% black) is offensive. The Annual Halloween attraction re-enacts a double hanging that took place in Pennsylvania’s Somerset County about 120 years ago which is why the image is even featured on the out-of-home ad. What do we think? Is this image appropriate for a Halloween Event. Or is this another group of people fighting for things to be more “politically correct”. AdFreak couldn’t say it better. This out-of-home ad is completely “Infectious”. Warner Brothers Pictures Canada took their advertising to a whole new level by creating this one of a kind storefront sign to promote their new movie Contagion. The billboard was created by Curb Media, who uses natural and sustainable materials to create their products. With Ad Agency Lowe Roche at the helm, they created this billboard completely made out of growing bacteria and placed it in an abandoned storefront window in Toronto. 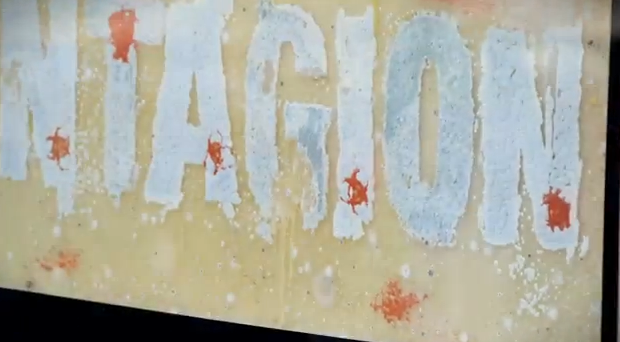 Scientists got together and used two large petri dishes filled with bacteria such as penicillin, mold and other pigmented bacteria which eventually spelled out the name of the movie. I love out-of-home ads. Without getting too cliché it really takes an “out of the box” type of group to come up with something so capturing. With the help of social media this was an instant classic and I only wish I was near Toronto so I could have seen it for myself!